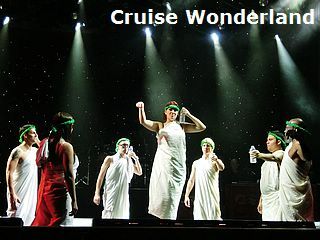 Other than enjoying fine dining in the main restaurants, the evenings onboard are the time for shows. 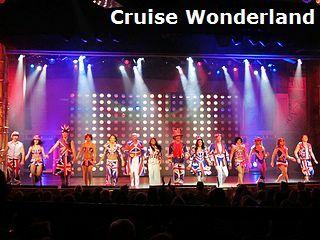 There are numerous entertainments offered from sunset to midnight, including a daily large-scale production show or cabaret act performed in the Princess Theater (or in the Vista Lounge occasionally), plus continuous dances, parties, music and games around various venues. 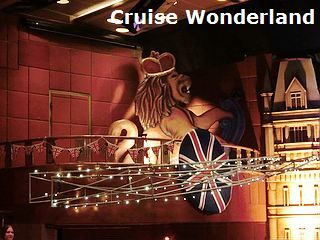 Located forward of Deck 6 and Deck 7, the two-deck-high Princess Theater is the biggest performing venue on the ship with over 700 seats and a large stage. 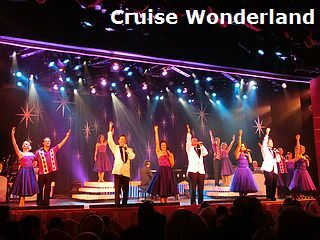 Production shows are usually performed here by the resident singers, dancers as well as the musicians in the small orchestra. 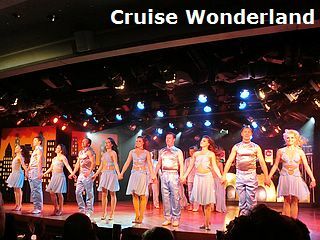 Other smaller shows can be scheduled in the Vista Lounge or the Explorers Lounge, situated aft and amidships of Deck 7 respectively. 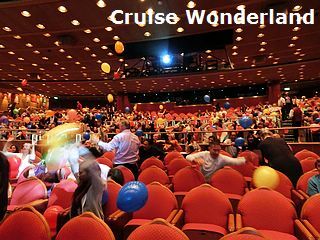 The show at the first night had only one seating at 21:00 in the Princess Theater for all passengers. It was composed of several parts. 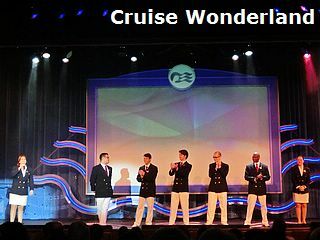 First of all the Cruise Director Frank Castiglione introduced the members of the Entertainment Team who are mainly from the USA. 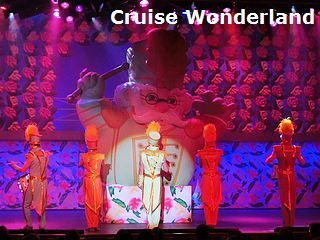 Then there was a video about various public rooms of Golden Princess, followed by a few scenes of welcoming show called "One Night Only" performed by the singers and dancers. 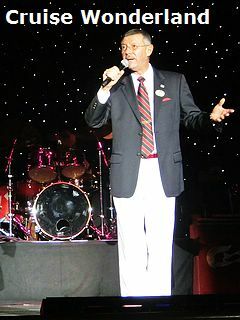 Finally the audience could enjoy a 15-minute comedy act by Rollin' Jay Moore, a comedian who has already performed on the stages of many Princess Cruises' ships. 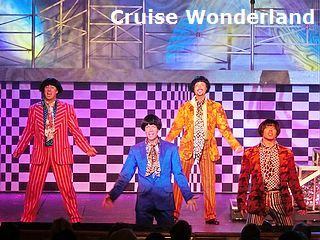 Introduction of the Entertainment Team Welcome Aboard Showtime "One Night Only" Welcome Aboard Showtime "One Night Only"
Day 2: Production Show "Motor City"
The comedy by Rollin' Jay Moore was repeated today for twice, at 20:15 and 22:15, in the Princess Theater. 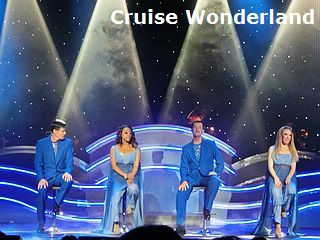 For passengers who had already watched it on the previous day, they could head to the Vista Lounge at 20:30 or 22:30 for the first production show on this cruise. 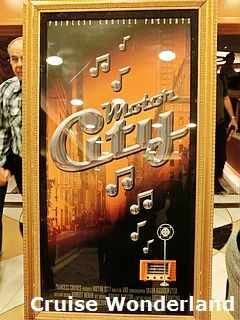 It was known as "Motor City", starring the Golden Princess singers and dancers. The 50-minute show was a tribute to America's heritage of soul, rhythm and blues which featured the music of Stevie Wonder, The Jackson 5, The Supremes, Tina Turner and other Motown sounds. Production Show "Motor City" Production Show "Motor City" Production Show "Motor City"
A number of shows were presented tonight. 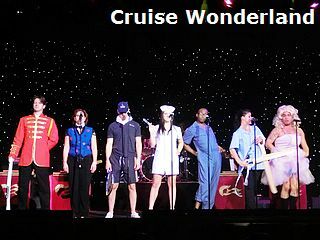 At 22:15 in the Princess Theater, there was The International Crew Talent Show in which some of the outstanding crew brought a variety of performances to the audience. 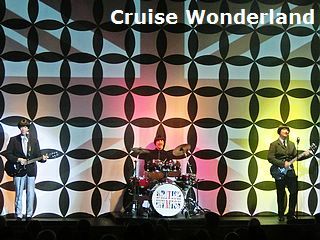 One of the highlights was "If I Were Not Upon The Sea", a very typical song on cruise ships' crew show. Each member of the Entertainment Team played a role of different professions, such as Sergeant Major, blackjack dealer, tennis player, nurse, barber and ballerina. Then it came the singing, guitar playing and dancing by some cabin stewards and waiters. Finally a mime was performed by the Entertainment Team. 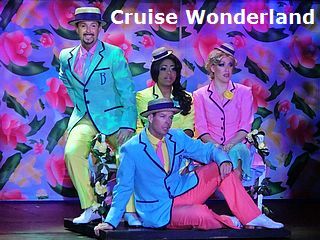 For more choices, passengers could also go to the Vista Lounge to watch the production show "Motor City" again at 20:30, and another late-night adult-only comedy show with Rollin' Jay Moore at 23:30. Day 4: Production Show "Stardust"
The second production show was a retro song and dance journey called "Stardust", which lasted for over 40 minutes. 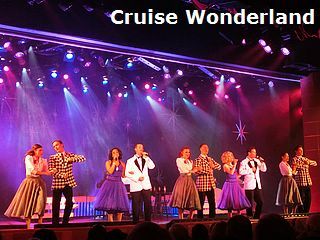 Exploring the music of the 1950s, the show featured songs like Stardust, Que Sera Sera, Come On To My House and Unforgettable. 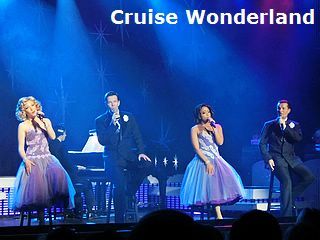 They were performed by the vocalists Bruce Smith, Amber Nelson, Jamie Anderson and Judith Franklin as well as other dancers. 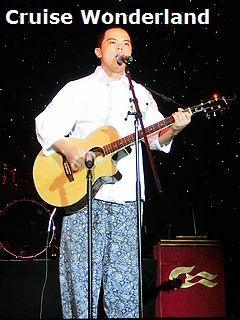 There were two seatings for this show, at 20:15 and 22:15 respectively, in the Princess Theater. 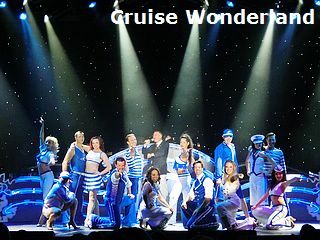 Production Show "Stardust" Production Show "Stardust" Production Show "Stardust"
Passengers could be amazed by the magic show by Alexander Grait in the Princess Theater today at 20:15 and 22:15. 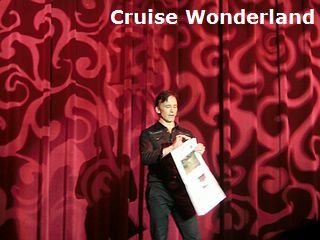 Alexander is one of the greatest American magicians in recent years who has performed on a number of cruise ships before. 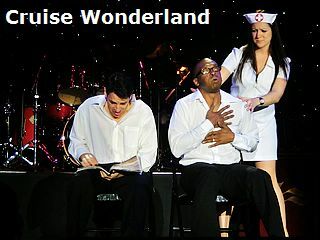 Together with his assistant, they brought the audience into mystery, fantasy and illusion, where many fascinating magic tricks were performed. 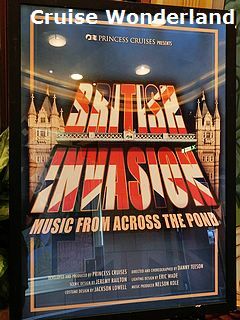 Day 6: Production Show "British Invasion"
The third and the last production show was known as "British Invasion", taking to the stage at 20:15 and 22:15 in the Princess Theater and lasting for 50 minutes each time. 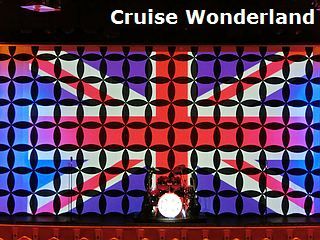 It featured a wide variety of music from the United Kingdom including The Beatles, The Rolling Stones, Queen and The Hollies. 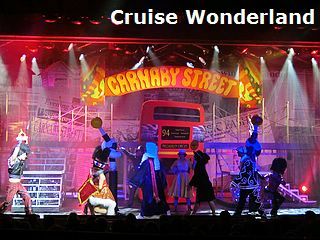 Many British iconic objects and scenes also appeared in the show, such as the changing of the guard at Buckingham Palace, mini skirt Mods, Carnaby Street, red telephone box and double-decker bus. If passengers missed the magic show of Alexander yesterday, they could have the opportunity to watch it again in the Vista Lounge today at 20:30 and 22:30. Production Show "British Invasion" Production Show "British Invasion" Production Show "British Invasion"
There were neither production shows nor other major entertainments tonight because of the evening call at Victoria. 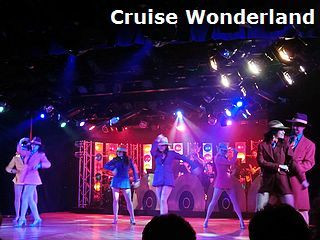 Most passengers were supposed to go ashore and thus only a few onboard activities were scheduled at the last night of the cruise.